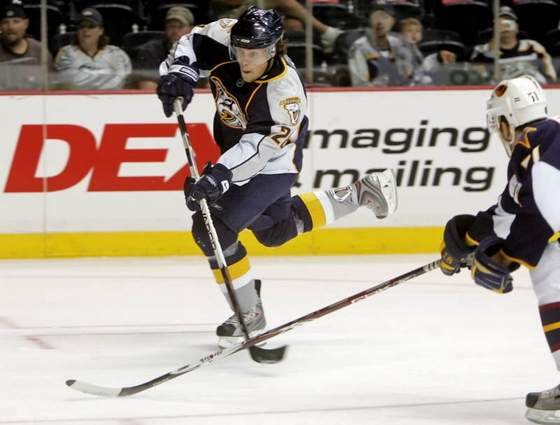 His career took off in the 1999-2000 season, playing 52 games with the Toronto Maple Leafs (Adams had only played 6 NHL games with Toronto in previous seasons.) His first full season in the NHL came with the expansion Columbus Blue Jackets in 2000, where he scored two goals, including the game winner, in the Jackets first ever win in franchise history, a 3-2 victory over the Calgary Flames on October 12, 2000. Adams, a 1993 first round draft choice of the Boston Bruins, is one of two Miami alumni to hoist the Stanley Cup, doing so with the Carolina Hurricanes in 2006, his best NHL season. Throughout his NHL career, Adams played 607 games, scoring 61 goals and 79 assists and suited up for Toronto, Columbus, Florida, Carolina, Phoenix, and Chicago. In his final NHL season with the Blackhawks, Adams only saw action in 27 games due to a knee injury, but attempted a comeback during the team’s training camp in preparation for the 2008-2009 season. That comeback was cut short, as Adams was released on the final day of roster cuts. Congratulations on a great career Kevyn. You’ve done Miami proud. Note: For those who would like to see current photos of King and Oates, simply click on their name to be taken to their profile with 02K.